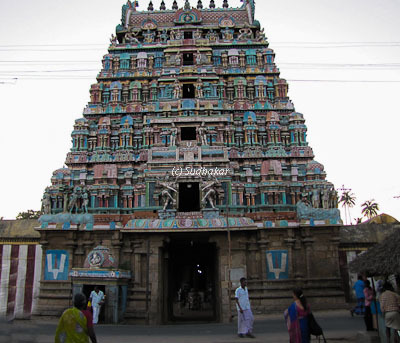 Thirunarayur also known as Nachiar Koil is one of the 108 divya desams near Kumbakonam. Naachiyaar Koil in Thiru Naraiyur is one of the few Divya Desams where the Thayar (Goddess) has prominence over the Lord. Some of the other Divya Desams where Thayar is dominant are Srivilliputhur, Uraiyur and Thiruvellarai. There is no separate Sannidhi for Goddess and she is always seen together with the Lord. The legend behind the temple goes thus Rishi Medhaavi wanted Goddess Lakshmi to be born as his daughter and undertook penance on the banks of the Manimukthar river. Pleased with his penance, Goddess was born under the Vanjula tree and the Rishi named her Vanjula Valli and brought her up. Both Lord and Nachiyar are seen here in a beautiful wedding posture, and the Lord stands in a begging posture seeking Vanjulavalli's hand from saint Medhavi in the Moolavar Sannadhi. In accordance to the saint's wish, Thaayar stands a step ahead to perumal. Even from the entrance of the temple, one can get a glimpse of Vanjulavalli Nachiyar.Shankarshnan, Prathyumnan, Anirudhan and Purushothaman too bless us in the moolavar sannadhi standing behind the Lord. Lord Sri Narayana of only a few Divya Desams have been praised as Nambi. The most prominent among them is Thiru Kurungkudi, the other one being here and He is referred to as Thiru Naraiyur Nambi. An Achaarya or guru is referred to as Nambi and since Thiru Naraiyur Lord initiated the Pancha Samaskaram to ThiruMangai Mannan, he became the Achaarya of Thiru Mangai azhwar and hence the azhwar referred to him as ‘Thiru Naraiyur Nambi’. The temple was built by the Chozha King Kho Chengan. Nachiyar Koil has 16 gopurams including the 5 tiered Raja Gopuram. The temple has been built in such a way that one can see the main sannidhi even from outside of the temple. With several steps leading to the sannidhi, the sannidhi looks like being atop a small hill. Garuda is the Vahanam (vehicle) to the Lord Narayur Nambi and 'Annam' (Swan) is the Vahanam of the Godess Vanjullavalli. Garuda has a seperate sannathi in this temple.In tamil month Margazhi and Panguni the festival "Kal Garuda Sevai" (ie) the festival where the idol of Narayur Nambi placed on the stone idol of Garuda and taken out into a procession. There is a unique speciality regarding the stone idol of Garuda which till date could not be explained. When taken out for a procession, until a step out fo his sannathi he can be easily carried by 4 persons. Then inside the temple his weight increases and has to be carried by 8 persons, then further outside the praharam he would weigh heavy and 16 persons are required to carry him. Totally outside the temple not even 32 persons are enough to carry him, he would get heavier and heavier ahead. Once the procession is over, and while returning to his sannadhi he would start losing his weight stage by stage in the reverse order. This Garuda is treated in equivalence to Lord Vinayaka and Mothakam named as "Amudha Kalasam" is offered to him. Kal Garuda is said to answer the prayers of devotees immediately and remove all doshams. 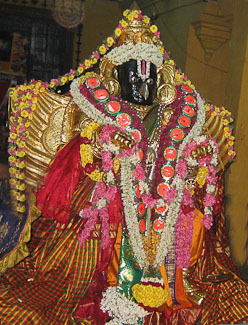 The Moolavar of this sthalam is Sri Thirunarayur Nambi. Also called as Srinivasan and Vasudevan.The Moolavar is giving his seva in a standing posture facing East in kalyan thirukolam ( wedding attire). Prathyaksham for Medavi Rishi and Brahma. The Thayaar in this sthalam is Vanjullavalli Nachiyar. Temple location It is situated around 9 kms from Kumbakonam on the Thiruvarur road. Town buses are available from Kumbakonam to Tiruvarur that goes via this place. Nachiarkoil which is just 9kms away can be reached by road from Kumbakonam by SH 65 . Kumbakonam is well connected by road and train services. Station at Kumbakonam and visit many heritage temples in the surrounding area of within 15 kms radius. Where to Eat?There are no big restaurants in Nachiar Koil. You can reach Kumbakonam for lunch / dinner.